Bespoke jewellery requires bespoke mechanisms to match. In this course, you will learn how to produce small jewellery mechanisms with precision. 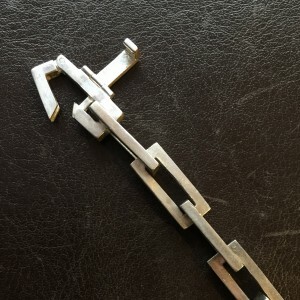 In this two day course, students will learn step-by-step how to produce a variety of hinges, clasps, as well as design and production of custom made clasps for bespoke necklaces and bracelets. The course will also explore different ways to implement these mechanisms. Each student will also come away from the course with an instructional information pack which outlines all the material covered as well as several designs not covered in this course, a great bench reference. Students will learn to produce a complex box clasp and hinges. The course is aimed at intermediate/advanced makers, not for beginners. Sawing, filing, soldering knowledge is necessary. Students who have some experience in jewellery will find this course challenging and informative. Saturday – Students will begin by producing a simple hinge similar to one found on a locket. Students will produce a box clasp similar to the style commonly used in pearl necklaces. A complicated, and useful mechanism, the box clasp will take all day to produce. Sunday- Students will learn to make low tech clasps, as well as brooch mechanisms.